Encore Real Estate Investment Services is pleased to announce the sale of a single tenant State-of-the-Art Prototype, Two-Story, 24-Hour Walgreens in Clearwater Beach, Florida with a record cap rate of 5.05%. Clearwater Beach, FL, January 30, 2018 --(PR.com)-- Encore Real Estate Investment Services is pleased to announce the sale of a single tenant State-of-the-Art Prototype, Two-Story, 24-Hour Walgreens in Clearwater Beach, Florida with a record cap rate of 5.05%. The 20 year Absolute Net corporate backed lease had approximately 16 years remaining on the lease term at the time of sale. Furthermore, the quality of the construction included a flood proof design, hurricane impact glass and an upgraded store front. The 22,000 square foot 24-Hour Walgreens is located on Clearwater Beach, voted the #1 Beach in America and just a block from the World-Famous Clearwater Marine Aquarium home to Dolphins Hope and Winter of Disney’s film Dolphin Tale and its sequels. The property is located adjacent to the roundabout for all incoming beach traffic in the premiere beach and resort community. "Tourist destination aside this is a vibrant retail market with almost 10% population growth and very strong demographics," said Senior Associate Brent Hanna. Brandon Hanna, Brent Hanna and Ryan Vinco represented the seller, a nationally recognized, preferred developer based in Florida. Brandon Hanna and Brent Hanna also represented the purchaser on this transaction, a private investor based in New York City. Encore REIS utilized its national marketing platform and techniques to source multiple offers and ultimately secured a sale resulting in unprecedented results for both buyer and seller. 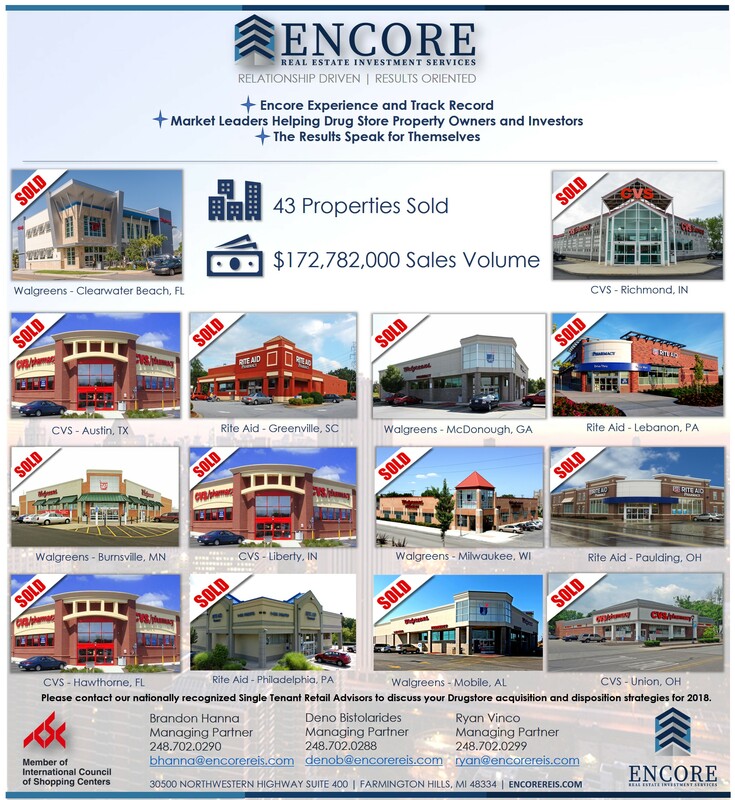 Encore Real Estate Investment Services is dedicated to assisting clients in the acquisition and disposition of net leased and multi-tenant retail properties across the country. We provide advisory and brokerage expertise with the highest level of commitment and attention to detail, which ensures a higher assurance of closing and a faster turnaround time as each client is assisted and advised on strategic exit and entrance strategies aimed at achieving their investment goals. Led by Principals Brandon Hanna, Ryan Vinco, Deno Bistolarides the team of distinguished brokers have evaluated, listed, sold and marketed over $5 Billion dollars' worth of investment restate nationally. We have a combined track record of investment real estate sales experience spanning 50 years. Through this experience, we continue to execute transactions on behalf of some of the most prominent developers, institutions and private investors in the industry. As such, we continue to build long-term relationships with the leaders in the investment community and grow our global database of investors and developers, which enables us to provide our clients with real estate investment services that are unmatched in the industry. We are results oriented - our advisors all have a shared vision of excellence and commitment to ensuring we are meeting our client's needs above all else.